I can hardly believe that my big brother is 5 today. I'm pretty sure I'll never be that OLD. Let's see; I'm, um, 3 I think. Yeah. That still sounds young, right? It must be cuz mom always calls me the "kid". So, you're probably wondering how we celebrated, huh? The usual stuff that Tanner thinks is fun: dog park and swimming. I had fun too, but no wet stuff for me. I swam last week when mom said it was time for my regular "reminder" of where the shallow step is. One of these days she'll realize I'll never forget, right? We Don't Need a Ball to Play Fetch! Oliver and I have been so very busy this week modeling for product reviews. We thought we'd share a few shots with you and tell you where you can find the products. Over at All Things Dog Blog, mom is busy reviewing Barking Deals, Terra Paws, and Planet Dog's Pet Sitter Instructions. You'll find all these reviews, complete with the requisite giveaways, at the All Things Dog Blog link above. Have fun entering to win these great prizes and more. Oliver and I thoroughly enjoyed devouring savoring our Terra Paws treats after we finished with each picture. No paycheck in the world can compare to a full belly! So Mom is outside, once again, doing water stuff with Tanner. She always invites me to participate, but this sort of activity doesn't float my boat, if you know what I mean. I'm a great swimmer, but it's not my thing. The bad part about this is that I get left out when Mom has water toys to review. Like today. 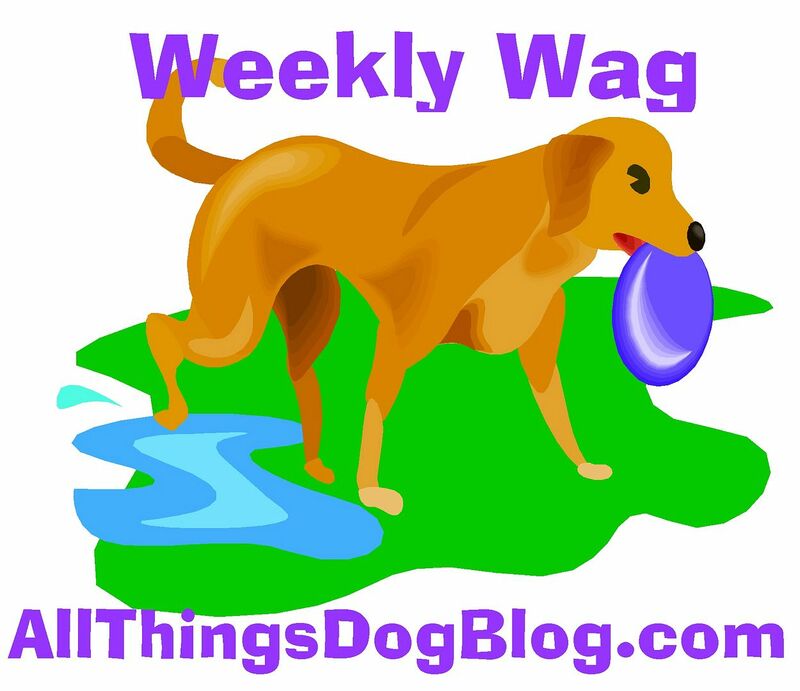 Over at All Things Dog Blog, she's got a fetch toy review of Floatimals, by Petmate, going on. Tanner is having a really great time playing with his new Floatimal. But me? I don't want any part of the water. Mom and Tanner are also giving away some Floatimals to you guys, so if you're interested in a new water toy, now's the time to head on over to All Things Dog Blog. Good luck. "Yo, Oliver. What cha doin over there against the wall, dude? ", Tanner asks. "It's yoga, man. I'm trying to get balanced. You know, like a Zen master", Oliver replies. "You look totally stupid, dude," Tanner insists. Oliver replies, "I'd like to see your version of a balanced canine." Tanner continues, "Ya know, we don't have to do yoga to be balanced. Mom's got a new "Ask the Vet" columnist who writes a blog called The Balanced Canine. We could just head over there and read some." "A new vet? Is this one a nice lady too?" asks Oliver. Tanner replies, "Nope. It's a dude. He's got a Yoga Dog on his blog. That's why you should go read it. You're apparently into being balanced and having Zen moments, right?" "How'd you find out we had a new vet?" asks Oliver. "Dude, don't you read mom's blog? She announced Dr. Mark's arrival on Sunday. You can read all about him at A Changing of the Guard: Meet Your New Ask the Vet Columnist. C'mon, Oliver. Ya gotta keep up now", Tanner teases. "Dr. Mark starts today, so check it out". 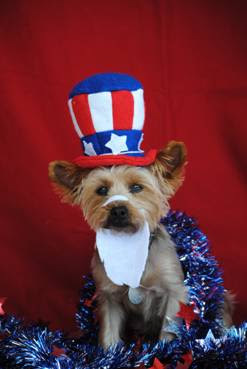 Is your ''buddy" ready for Independence Day festivities? Check out our post at All Things Dog Blog, where we have offered some tips on helping your fido get through the noise and bright lights of tonight's fireworks that frighten so many dogs. Happy tails!